242 Marlborough is located on the south side of Marlborough, between Exeter and Fairfield, with 240 Marlborough to the east and 244 Marlborough to the west. 242 Marlborough was designed by architect Samuel D. Kelley and built in 1881-1882 by Keening & Fellows, masons, for real estate dealer Henry Whitwell. He is shown as the owner on the original building permit application, dated July 26, 1881. Click here for an index to the deeds for 242 Marlborough. 242 Marlborough was one of nine contiguous houses (230-232-234-236-238-240-242-244-246 Marlborough) built in the same design and with similar architectural details, the only significant difference being the use of bows (rather than octagonal bays) at 244-246 Marlborough, the last two houses built. 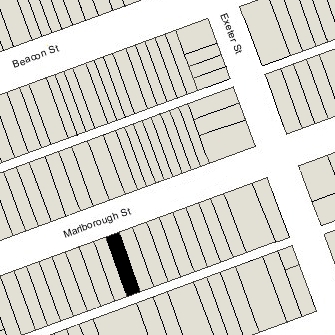 The original permit applications for all but 244 Marlborough are included in the Building Department’s files. Three of the applications – for 230, 232, and 246 Marlborough – indicate the architect as being Samuel D. Kelley. The other five applications do not indicate the name of the architect, but the houses are attributed to Samuel D. Kelley by Bainbridge Bunting’s Houses of Boston’s Back Bay, which, given the close similarity in design, appears to be correct. Bunting also indicates that all nine houses were built for building contractor Samuel Tarbell Ames. This does not appear to be entirely correct. Based on the permit applications and final building inspection reports (to the extent that they are available), six of the nine houses were built for real estate dealers (and brothers) Frederick Augustus Whitwell (shown as owner of 230 Marlborough), Henry Whitwell (shown as owner of 238-240-242 Marlborough), and Samuel Horatio Whitwell (shown as the owner of 244-246 Marlborough), and three (232-234-236 Marlborough) were built for Samuel T. Ames. The land for all nine houses was sold by the Commonwealth of Massachusetts at public auctions in November of 1879. It appears likely that the Whitwells were the successful bidders and held bonds from the Commonwealth assuring them the right to purchase the land. They probably retained Samuel D. Kelley to prepare a common design for the houses and retained Samuel T. Ames to oversee their construction, transferring the bonds for the lots at 232-234-236 Marlborough to him as compensation. He then acted as the builder for those three lots and oversaw the construction of the other six. Alternatively, he may have been the successful bidder for the three lots and used the same plans prepared by Samuel D. Kelley for his three houses. In most cases, when the houses were nearing completion, they were sold to individual buyers who purchased the land directly from the Commonwealth and paid the Whitwells or Samuel T. Ames for the cost of the dwelling house. Frederick Whitwell kept 230 Marlborough, the first house built, as his home. Samuel H. Whitwell kept 244-246 Marlborough, buying the land and then reselling the land and houses to individual buyers. By the 1882-1883 winter season, 242 Marlborough was the home of Joseph Henry Meredith, a merchant, and his wife, Mary Elizabeth (Farnsworth) Meredith. Mary Meredith purchased the land for 242 Marlborough from the Commonwealth on July 31, 1882. They previously had lived at 15 Mt. Pleasant Avenue. Joseph Meredith died in September of 1890. Mary Meredith continued to live at 242 Marlborough. By 1893, she was joined there by her sister-in-law, Elizabeth Howard (Meredith) Smith, the former wife of Christopher DeWitt Smith. Mary Meredith died in December of 1904. Elizabeth Smith moved soon thereafter. By the 1905-1906 winter season, 242 Marlborough was the home of Joseph and Mary Meredith’s daughter, Elizabeth Loring (Meredith) Tappan, the widow of wool merchant Frederick Herbert Tappan. 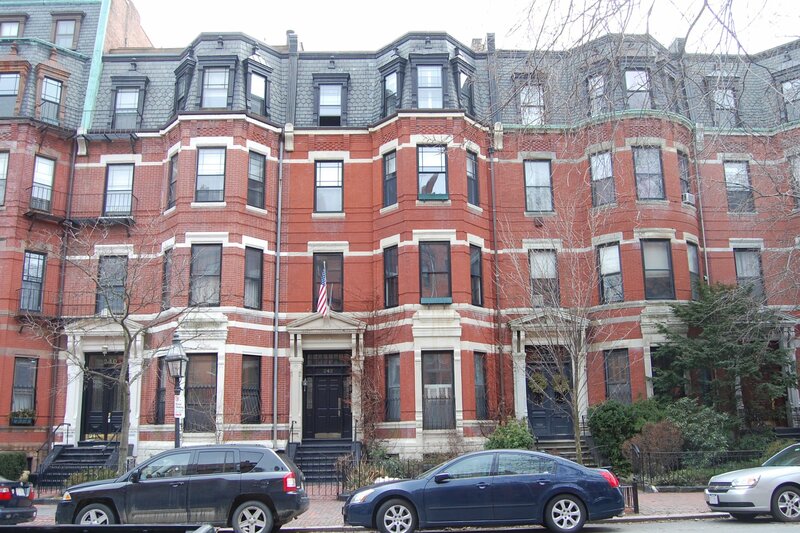 She previously had lived at 171 Newbury, where her husband died in December of 1900. Elizabeth Tappan’s son, Robert Meredith Tappan, an engineer, lived with her until his marriage in October of 1912 to Catherine Hill Foster. After their marriage, they moved to Charles River Village. Mrs. Tappan continued to live at 242 Marlborough until about 1945. On June 8, 1945, 242 Marlborough was purchased from Elizabeth Tappan by Edward M. Hamlin, an investment banker, and his wife, Helen Elizabeth (Sanborn) Ralls Hamlin. They lived in West Newton. On September 25, 1945, 242 Marlborough was acquired from the Hamlins by Hans Rudolf (Rudolph) Giger and Richard W. Langenbach, partners in the Longwood Engineering Company. In October of 1945, the Longwood Engineering Company filed for (and subsequently received) permission to convert the property from a single-family dwelling into five apartments. On December 10, 1946, Longwood Engineering transferred the property to H. Rudolf Giger and his wife, Helen Mae (Kidd) Giger. They lived at 292 Marlborough. He was a dealer in artists’ materials and supplies. On May 6, 1949, they transferred the property into Helen Mae Giger’s name. On February 28, 1950, 242 Marlborough was purchased from Helen Mae Giger by Dr. George J. Colantino, a physician, and his wife, Edith E. (Fitzgerald) Colantino. They lived at 300 Commonwealth. On May 1, 1956, 242 Marlborough was purchased from the Colantinos by Lawrence Clarke Hill, a salesman, as trustee on his own behalf and for the benefit of his wife, Emilie (Parrock) Hill. They lived at 396 Beacon. 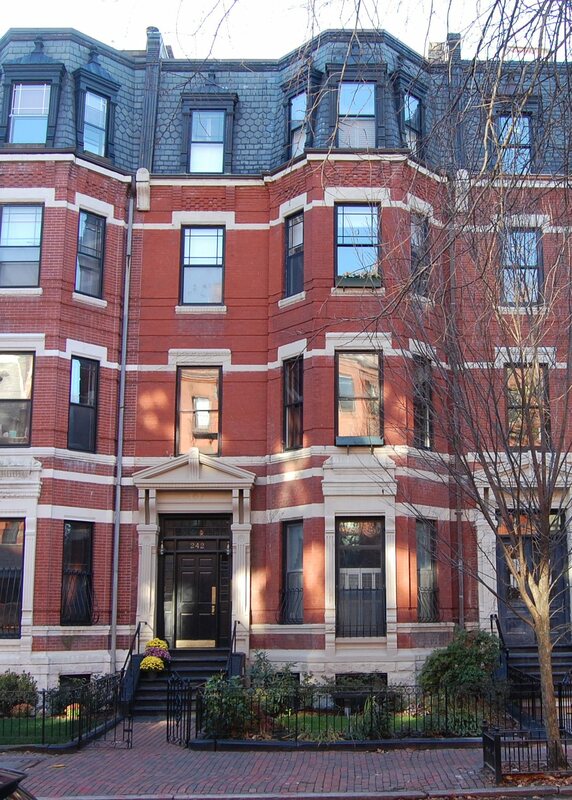 On November 2, 1970, 242 Marlborough was purchased from Lawrence C. Hill by Malcolm MacPhail, Jr., trustee of the 242 Marlborough Street Realty Trust. 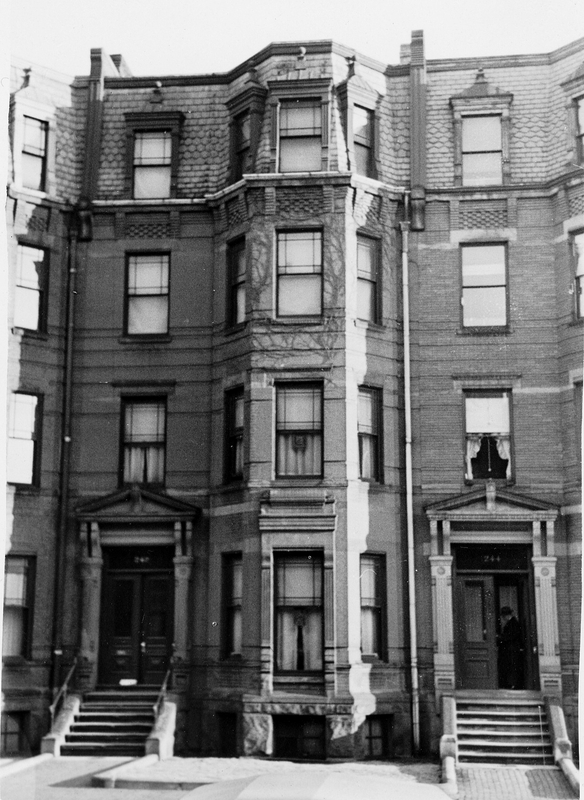 On August 31, 1974, he converted the property into five condominium units, the 242 Marlborough Street Condominium.